Tiffany Parker is social entrepreneur who started her own graphic design business Above and Beyond design. She is also an active member of Tabernacle Church of God In Christ where she serves on several ministries on the local and regional level. 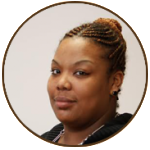 Tiffany has diverse experience working with youth in the Kalamazoo Northside area. For several years she worked at Lincoln Elementary school, and other community organization such as the YMCA doing youth development work. She spends her summers motivating and inspiring youth through volunteering with the Youth Basketball League program. Tiffany has recently been appointed to serve as the 2014 Youth Basketball League Commissioner.